The Album Of The Day is not really Stoner Rock but a very cool album nonetheless. 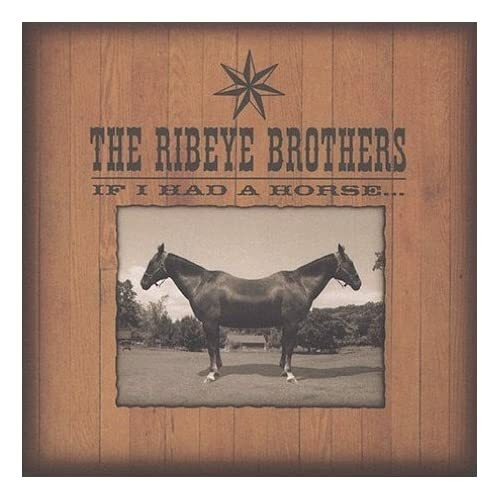 Check out "If I Had A Horse..." by The Ribeye Brothers. "New from MeteorCity, probably the most well-established stoner rock label in the world, comes... NOT STONER ROCK! That's right, you heard it, this album is MeteorCity's first departure from their main musical focus - and it's amazing! The Ribeye Brothers, a duo comprised of the talents of Jon Kleiman (Monster Magnet's drummer) and Tim Cronin (Monster Magnet's ex-singer), have created a crazy dose of psychobilly. On the album, they've infused traditional country music with a garage style. All of the songs on "If I Had A Horse..." are thoroughly entertaining and suitably catchy. The best track is "Mister Ray Charles" (and its 'sequel,' "Mr. Ray Charles"), an irresistible assault of melodic cowpunk that's sure to get you singing along. Also great are "Drinkin' And Stinkin'" and "Swagger Turns To Stagger", both of which are downbeat, gritty tracks of the outlaw country persuasion. It's hard to determine where The Ribeye Brothers take their influences from. Their Monster Magnet roots seem to have been lost in the mix, as the Brothers seem to owe more to The Supersuckers and Johnny Cash than they do to the legendary drug-rock band. However, their gritty, drug-influenced stylings have been injected into the predominant country sounds, lending "If I Had A Horse..." a style of its own.